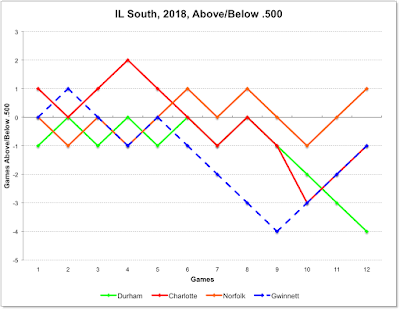 The Bulls swept the Gwinnett Stripers and now go head-to-head with the South Division leader the Norfolk Tides, the Orioles AAA franchise. The Bulls are only 1/2 game back and are on something of a roll. The Tides just finished a losing series with Charlotte. The matchup is pretty close. 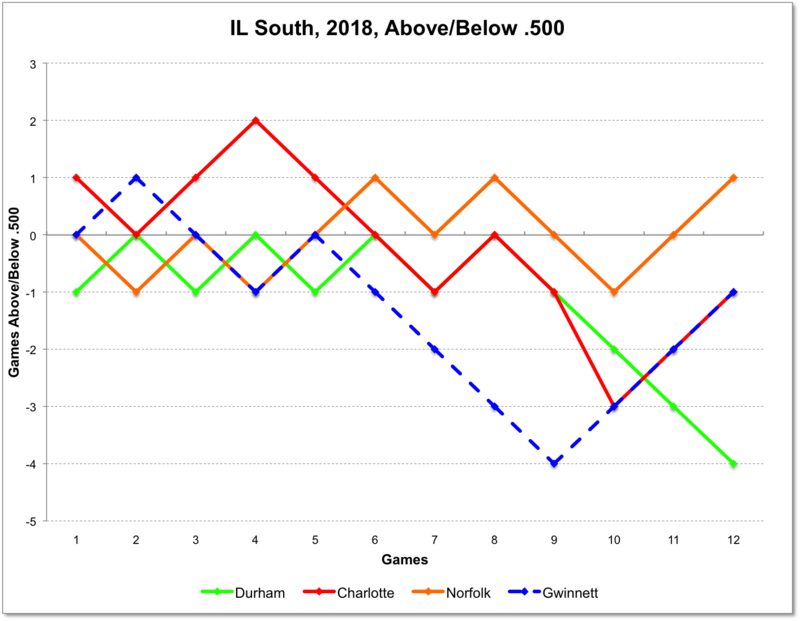 Durham certainly has the overall edge in pitching, but otherwise, it looks as if the teams (and fans) are going to have some fun. Team ERA showed a modest improvement, going from 2.72 down to 2.63. 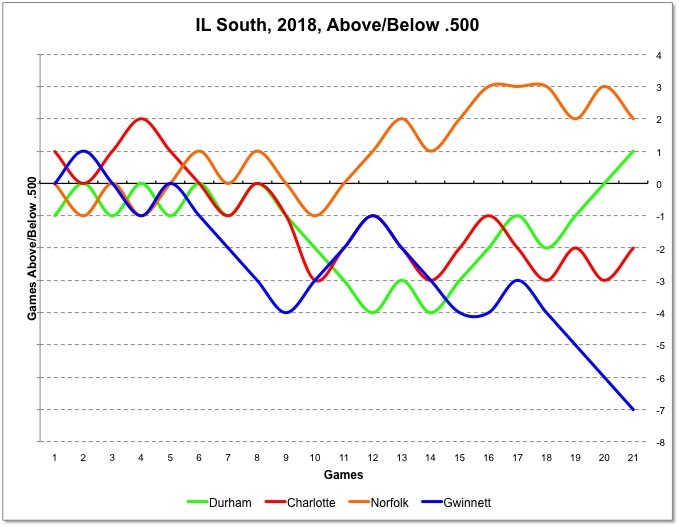 Team OPS improvement was impressive, from .642 to .692 in just six games. The individual player story-of-the-week was, of course, Willy Adames, who hit a grand slam on Sunday, then hit for the cycle on Monday. Those heroics were still not enough to get noticed by the Durham Herald-Sun, but did merit a mention several days later in the Raleigh News & Observer. In addition to Adames' 2 homers, we saw 5 other home runs by Jason Coats (2), Adam Moore (1), Brandon Snyder (1), and Jake Bauers (1). The Bulls are off to Lawrenceville, Georgia to play three games against Atlanta's AAA affiliate, the Gwinnett Stripers. They then take the bus and drive past Durham to get to Norfolk for three games against the Tides. I failed to mention that one of our favorite guys from 2016 is now with the Stripers, Jaff Decker. I liked the way he played the game in his time with the Bulls. A grand slam off the Bull is very cool. Congrats to Willy Adames (and to Jason Coats for his homer). And the first shutout of the year is also nice. Are the Bulls getting on track? Maybe. Meanwhile, young Andrew Velazquez at second base is a serious talent and fun to watch. Nice to know that the Bulls can deal with Kean Wong's trip to the DL without great harm. We didn't write all that much about Danny Farquhar while he was a Bull in 2016 (although we did misspell his name a lot — three times in one post). Still, if we had a decent sports press corps in the area we'd at least know a little bit about what now seems to be a really interesting guy. See today's USA Today. The Buffalo Bisons suffer from playing in Buffalo — they've played four fewer games than the Bulls this year (rain, sleet, snow, etc). At that, however, they outmatch the Bulls in hitting by a quite a bit. On the other hand, the Bulls have the best ERA in the league. On the Bisons' pitching staff is young Taylor Guerrieri, a first-round pick of the Rays with 5 productive years in the system, who had two starts with the Bulls last year, and then ended up in the Blue Jays system. Looks like they are using him as a reliever. 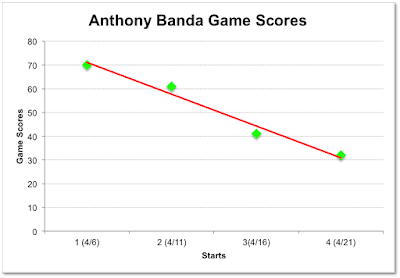 Anthony Banda has only had four appearances, but his game score trend is disturbing (50 is "average"). Last night it was either strike 'em out or give up a solid hit. I only recall one easy infield ground ball. No doubt he's a talented guy, but here's hoping he gets into a rhythm. Otherwise, Lehigh Valley's 22-year-old Enyel De Los Santos was an uncomfortable pleasure to watch. Assuming he doesn't blow out his arm along the way, he's going to be a star. The Bulls hometown newspaper, the Durham Herald-Sun, has not run a single game story since opening day. Must be awfully lonely up there in the press box. Has anyone else seen any stories that were not re-writes of the Bulls' own press releases? You'd think they'd at least mention the hospitalization of Danny Farquhar who pitched in 32 games for the Bulls. The Tampa Bay Times had a nice piece. I'm struggling to find something good to say about the Bulls' trip to Ohio. The weather was awful with one rainout and one game shortened by snow. Most games were played with temperatures in the 30's and low 40's. And, as might be expected, played to essentially empty stadiums in Columbus and Toledo. The Bulls lost 5 of the 6 games played. They arrived back in Durham in last place in the International League South Division. RHRP Ryan Weber came down from Tampa Bay (he had one appearance as a Ray). So far he has 1 inning with a blown save as a Bull. RHSP/RP Chih-We Hu went to Tampa Bay, put in 2 2/3 innings in relief, and has come back. Switch-hitting infielder Andrew Velazquez came up from Montgomery and has stolen 4 bases in two games so far. Infielder Jake Cronenworth came up from Montgomery and has played in two games. Outfielder Johnny Field was called up to the Rays. The Phillies AAA franchise the Lehigh Valley IronPigs are having a decent start to the year. They are in the middle of the pack in the IL North (standings). Plus they are the only other team in AAA baseball with a fan blog (although they, like us, have not been all that busy this year). They are obviously hitting and fielding very well (only 1 unearned run). The Bulls started the season with a 3-3 homestand. And looked OK.
On Twitter we're hearing that Johnny Field has been called up and the Bulls roster shows outfielder Jeremy Hazelbaker coming down from Tampa Bay. Very pleased to see Field get his chance. The Bulls are off for their first out-of-Division games this year with a trip to Columbus to play Cleveland franchise, the Clippers, then off to Toledo to play the Detroit franchise, the Mud Hens. The Clippers are the frequent power in the West Division. So far this year their pitching isn't helping them much. But it's very, very early days. Ugly weather day at the DBAP. I never made it out there. I watched via MiLB. I have to point out that the two Bulls wins so far have been gifts from the opposing pitchers. But it's early days. Chih-Wei Hu, RHSP, got the first start. This will be the third year that he's spent time with the Bulls. Last year he began as a starter and finished as a reliever. Now he's back as a starter. His first appearance this year was not very impressive. Adam Kolarek, LHRP, is a back-and-forth to the Rays reliever from the last two years and we like him a lot. He did give up some hits in his first appearance, but did fine his second time out. Ryne Stanek, RHRP, had 36 appearances with the Bulls and 19 with the Rays last year. He's already made three this year. Not sure why he didn't stay with Rays out of spring training, but likely to go back any day now. Anthony Banda, LHSP, started game 2 and he looked very good. Banda was part of a complicated trade with the Arizona Diamondbacks and is considered a top prospect. He is on the Rays 40-man. Ian Gibault, RHRP, is coming up through the Rays system. His relief appearance in game 2 was his AAA debut. Hunter Wood, RHRP, was a really interesting guy to watch last year and extremely important in the playoffs. He's made two appearances and picked up his first save yesterday. Jose Mujica, RHSP, got the start (his AAA debut) and the loss for game 3. He is the youngest pitcher on the team, coming up through the Rays system. My guess is that he will be either stick around and be thoroughly tested or go back to AA for more work. Jonny Venters, LHRP, made his first appearance in game 3. He was helpful in the playoffs last year, but mostly he's been battling injuries for the last several years as he recovers from Tommy John surgeries. He could be a real asset if he continues on his healing track. Jamie Schultz, RHRP, is back and we're happy about that. He's running out of time, but we love seeing him on the mound. Good luck. Diego Castillo, RHRP, opened his 2018 season with one inning's work and 3K's. We would expect no less. He had 3 saves in the playoffs, following a terrific post-All-Star break season with the Bulls. Vidal Nuno, LHSP, started game 4. He's bounced around a lot in his career over several years and a good bit of major league time. He looked just fine yesterday, just giving up the one home run. Forrest Snow, RHRP, made his first appearance in game 4. He's got AAA time over 8 seasons. He took free agency at the end of last season and was signed by the Rays. Charlotte's Chris Volstad gave up a couple of runs in the 5th, so reliever Robbie Ross came in and threw a couple of wild pitches moving runners around, then a walk, then two singles, and then another walk. Rose left the game with 4 earned runs and an essentially infinite ERA on the year. By the time Ross' replacement, Tyler Danish, finished the inning the Bulls had scored 8 of their 11 runs. A big inning on a big night. 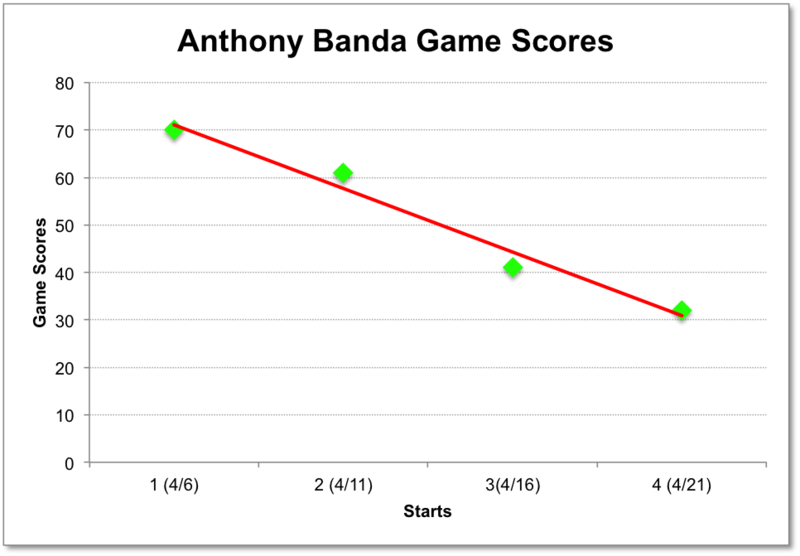 Bulls starting pitcher Anthony Banda, out of the Arizona system, was impressive. Brandon Snyder started at 3B and batted 5th in the order last night. If he looks familiar, that might be because he's played with almost every team in the International League including Norfolk, Pawtucket, Gwinnett, and Syracuse. He brings a wealth of experience to this young team. Last night he was 1 for 4. Micah Johnson started in center field and batted 6th. He is out of the Atlanta system with time with both the Charlotte Knights in 2015 and Gwinnett last year. He was 2 for 4 last night with 2 RBI. Adam Moore started at catcher and batted 9th. Moore is the "old man" on the team at 34. He spent the last two years with Columbus and can be seen at work in the video above with a nice strike 'im out, throw 'im out sequence. He was 2 for 5 last night with 3 RBI. I'll get around to the pitchers eventually. Weather for tonight does not look good. Let me refer you to my advice on dealing with rain up to the right, or you can click here. 2018 Durham Bulls Opening Day Roster. A quick glance here shows 7 pitchers and 4 position players on the Rays' 40-man roster (about average). Several familiar names.